U.S.S. LCS (Landing Craft, Support) 82 encountered fierce kamikaze attacks on two separate days in May 1945 during the Battle of Okinawa. The crew of 6 officers and 63 men escaped damage, but destroyers at the same radar picket stations as LCS 82 suffered heavy damage and loss of life. The idea for this book came from a 1988 reunion of the National Association of U.S.S. LCS(L) 1-130. John Rooney, radioman aboard LCS 82 from the time of her commissioning in November 1944, gathered the recollections from over 20 crewmates and weaved them together into a chronological history of the ship. More than half of the book consists of reminiscences of LCS 82's former crewmen, and the remainder gives a basic ship history, comments by Rooney, and a few official documents such as deck logs for selected dates. The only photo other than the one on the cover is a blurry photo of LCS 82 in Tokyo Bay. The crewmen's stories sometimes cover the same events, but they provide insights into individual emotions as they faced enemy attacks by air and sea. Captain Peter Beierl provides extensive comments and excellent background descriptions in addition to personal anecdotes. Both tincans [destroyers] took a lot of evasive maneuvers, as they managed to shoot down a record number of attacking planes. The four small Amphibs of their screen picked off a few planes too, but were threatened less than the more attractive big DD targets. We screen stuck fairly close together, racing to try to keep close to the larger pickets. Our own ship had two very close calls. The first was a Tony, overhead at a thousand feet or less when we shot off his tail. At first this seemed a good thing, but then, as the plane went into a flat spin - falling leaf style - everyone topside seemed to realize that the aircraft was rapidly getting bigger, but not changing bearing. On deck the aft damage control party rushed forward - and the forward one rushed aft. On the bridge, someone ordered "full speed ahead" in a voice which must have betrayed a trace of strain. It caused a few nervous moments for those below, unable to see what was going on. The extra speed was just enough, and the Tony crashed into the water right in our wake - too close, but a miss. LCS 82 helped save Evans as men pumped flooded engine and boiler rooms, brought aboard wounded and dead, and assisted in shooting down a kamikaze Val diving at the destroyer dead in the water. On May 27, 1945, in the chapter entitled "Hell for Breakfast," LCS 82 assisted again when two kamikaze aircraft crashed into the destroyer Braine (DD-630). LCS 82 crewmen fought fires aboard Braine and pulled survivors out of shark-infested waters. We recovered one who had not made it, hanging pale and lifeless in his Mae West, a leg torn away, the other arm gone, gutted by the sharks. He had escaped the terror of incineration on his ship. The horror and revulsion, the anger and wrenching pity we felt had to be swept aside by the urgent need to react quickly to all that was happening. Our feelings of shock and compassion would have to be dealt with later when the skies were quiet, the wounded and dead taken care of and the fires and damage under control. In time the shock and horror would pass. The pity would remain. We machine-gunned the sharks. In their mindless savagery they started tearing each other apart, this time turning the ocean crimson with their own blood. LCS 82 not only did picket station duty but also guarded Okinawan harbor perimeters and provided artillery support for the ground campaign on the island. One chapter describes a night when an explosive-filled suicide motorboat, called a "skunk" by the US Navy, barely missed LCS 82, but the ship's gunners managed to sink it moving away from the ship after its near miss. Mighty Midget U.S.S. 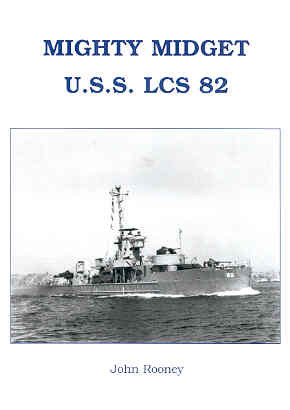 LCS 82 provides valuable firsthand accounts of kamikaze attacks and damage during the Battle of Okinawa from the perspective of the crew of an amphibious support craft.